One of my favorite places to visit is the marvelous migratory bird sanctuary and Nature preserve at Bosque del Apache near San Antonio, New Mexico. 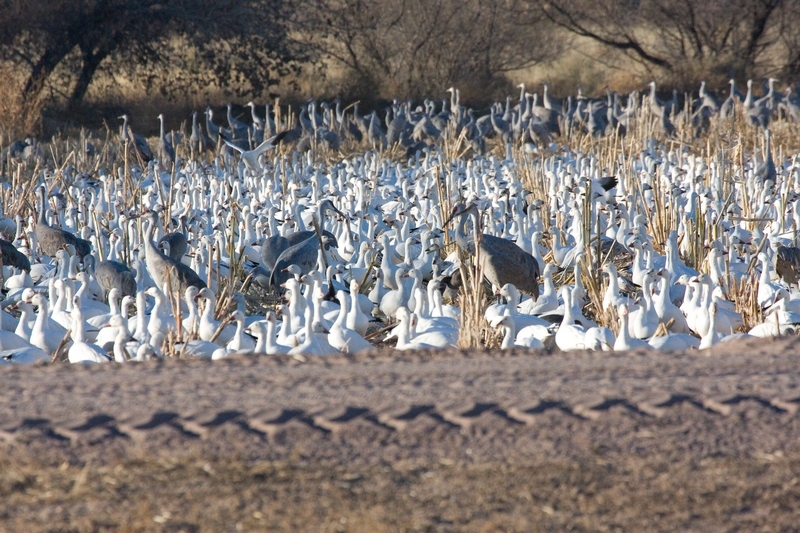 A two hour drive south of Albuquerque on route 25, Bosque del Apache is operated by the US Fish and Wildlife Service (USFWS). I’ve written a previous blog about this wonderful place which emphasizes connections in Nature . 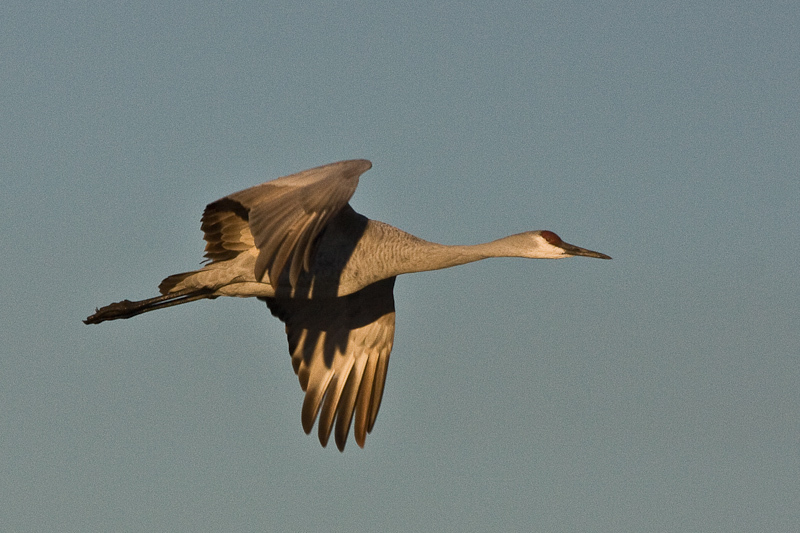 Every autumn, huge flocks of migrating birds (including Sandhill Cranes, Snow Geese, and various duck species) visit the area to fatten up during their migratory journeys. 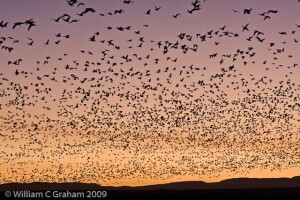 It is an awesome sight to see thousands of birds move to and from their nocturnal roosting areas to fields where they feed on corn and other grains purposely grown for their benefit. 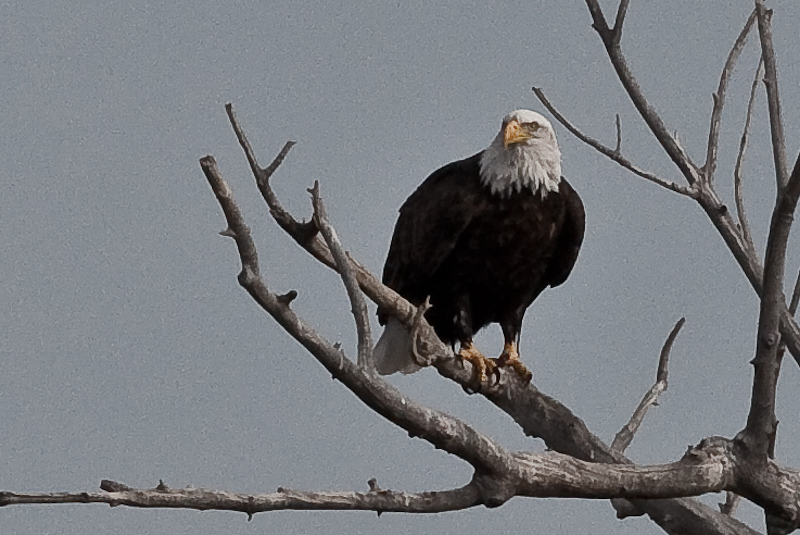 Every November, the sanctuary sponsors a week-long festival that includes many expert presentations about bird biology and the ecology of the area. There is also a wonderful photography workshop that goes on most of the week. I have been impressed by the quality of the USFWS and volunteer staff both during the festival and throughout the year. These folks are true stewards of Nature. Nonetheless, when one looks closely at the history of mankind’s influence on the Rio Grande River, the layout of the preserve, and the farm operations that grow feed for the birds, one realizes that the entire operation is not something that happened naturally. Indeed, the entire layout is engineered by the USFWS. This government agency is quick to let everyone know that all of this is for the benefit of the birds. I’ve been told that the preserve is a reconstruction of an ancient flyway because mankind did much ecological damage in the diversion and damming of the Rio Grande River. The extent of the “engineering” includes the cutting of ponds, the clearing of ponds, and the filling of ponds with water pumped from the nearby Rio Grande River. There is also a complete farming operation to grow food for the birds. The farming includes the regular knocking down of corn crop rows to provide access of the corn to the birds. The entire operation is not Nature’s creation at all. It is the creation of the USFWS. The Albuquerque Journal says “Treasure for sure, but natural?”. The newspaper also also comments “… the ‘natural’ effects visitors see are the result of intense human management”. Aldo Leopold described this as “recreational engineering”. When all of this hit me, it was like someone telling me, as a kid, that Santa Claus is a human invention and never really existed. Nevertheless, I reluctantly accepted all of this because the USFWS told us that it was for the benefit of the birds. I bought the idea because I implicitly assumed that the birds would not survive without Bosque del Apache. Besides, I absolutely love the place !!! However, I am a skeptic because I know that no one can predict Nature. I read about all of this too late for any comment. But the whole idea of some group trying to “manage” Nature was/is totally foreign to my way of thinking because it has been shown over the past 30+ years that the outcome of any process within a complex system (an ecosystem is a complex system) cannot be predicted. It was clear to me that the USFWS employees, despite good intentions, had not gotten the word. They had not been trained in the field of system science even though ecosystems can be best understood using the well published tenets of system science. I tend to be quite forgiving on this point, however, because system scientists speak a language that is totally foreign to a naturalist. It is very sad that Western science is so compartmentalized there is no sharing of useful knowledge. In this case, the USFWS knowing something about complex systems would have provided the important perspective of how and why everything in Nature is connected. At least, I thought so. I was intrigued by a dialog between the preserve manager and an Albuquerque news reporter. The subject was some of the preserve’s dried up ponds caused by the current drought. The reporter, concerned about the dry ponds, wrote that the manager “responded with a wildlife manager’s equanimity: ‘Healthy wetlands are fluctuating wetlands. Drought is a natural occurrence. Our landscape evolved with drought’ “. I was struck by the fact that the preserve manager’s “equanimity” or logic was not applied to the elk who are more of a “natural occurrence” than the man made ponds. But yet they are being killed. And with the elk incident, it is clear that the USFWS manager does not understand that humanity cannot control Nature even though they’ve done a fine job “engineering” the preserve ponds and farms to date. With all of this, two questions came to mind. The first question is: “Instead of killing elk, why not just plant more corn or call upon the local farmers to supply more corn?”. After all, it is the local farmers who are also benefiting with the preserve’s presence (see below) I find it an important question because I personally abhor the killing of wildlife as a government “management practice”. I’ve written about this previously when the USFWS proposed killing cormorants who were eating wild salmon and causing problems with the wild salmon fishery. To add to the issue of killing elk, the good folks at Bosque del Apache admit to facing another similar ecological issue in the future. The so called excessive population of Snow Geese at the preserve. What will their solution be with respect to the Snow Geese ? My second question is much deeper. “What would happen to the birds if the preserve simply closed its doors and ceased to operate?” Do the birds really need the preserve? Up until recently, I was under the impression that the birds really needed this sanctuary to survive because of the damming and diversion that mankind had done to the Rio Grande River years ago. But, I then read the recent public notice carefully: “depredation to the refuges croplands causes cranes to forage outside refuge lands, causing depredation to neighboring landowners crops resulting in economic harm to the Middle Rio Grande Valley”. With this and similar comments in the public notice, the USFWS provides the true reason for the existence of Bosque del Apache and some other preserves around the country. The beneficiary from all of this is the farmer. 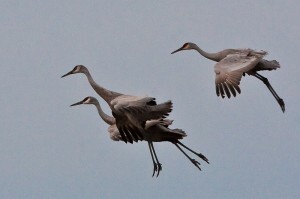 By diverting the Sandhill Cranes and other birds to preserves, the birds won’t eat the farmer’s crops. Within the preserve, the birds are spared death by way of a farmer’s shotgun. The public notice goes on to comment about elk eating agricultural crops as well. The USFWS talks about killing elk because they are “nuisance animals”. The USFWS describes all of this as “Providing food, water, shelter, and space for wildlife is accomplished by combining management techniques”. Aside from my strong objection to killing wildlife as a “management technique”, I’m OK with the USFWS providing preserves if there were some real truth to the idea that they can manage Nature. The fact is, they can’t. For about 50 years, the scientific discipline called “complexity science” has shown that the behavior of complex systems is not predictable by mankind. The weather is considered a complex system. We all know that local weather cannot be predicted much farther in advance than about a week. We also know intuitively that the stock market and the economy, both complex systems, are not predictable despite what stock brokers and economists might tell you. Ecosystems are also complex systems. Sandhill Cranes, Snow Geese, and Elk all live within ecosystems. Indeed, the life history of each species is an ecosystem within a larger ecosystem. 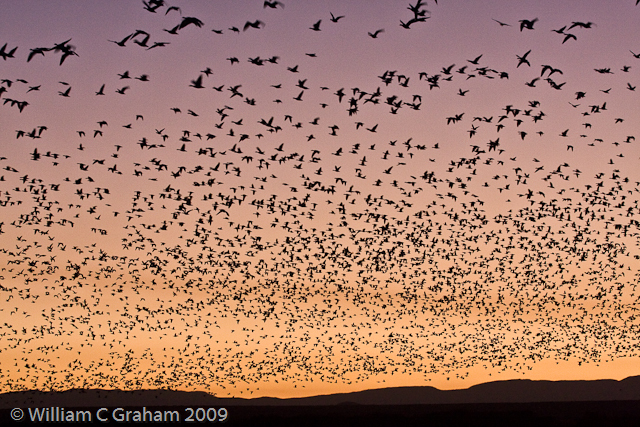 Despite what the good people at the USFWS might hope, they cannot predict what will happen to the Bosque del Apache ecosystem that they created. The very problem they are now having with Elk proves the point. 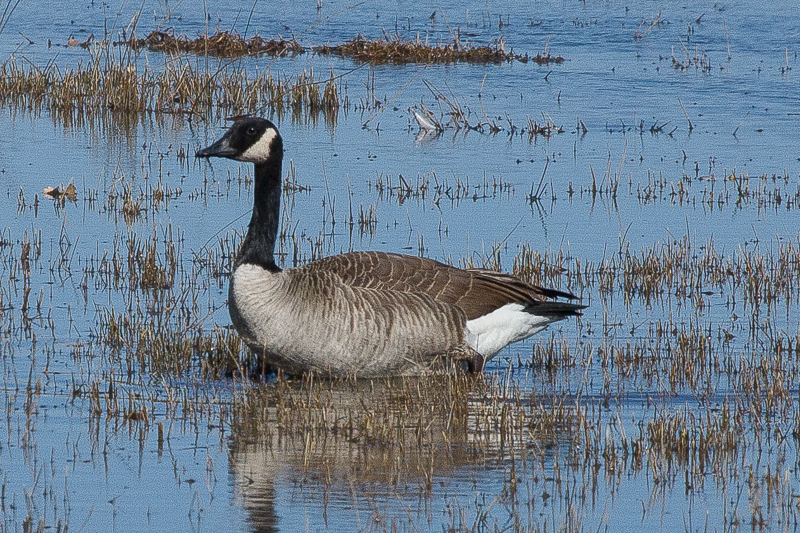 So does the pending problem with Snow Geese. The USFWS are smart people and they are good, well intentioned people. But, they lack the training in complex systems to understand the problem. They have no way of predicting what will happen when they kill some elk – even though they think they do. But, we can’t really blame the USFWS staff. The problem is that the field of complexity science speaks a language that is foreign to biologists and ecologists. This large knowledge base can be of great benefit to those naturalists who labor to preserve ecosystems throughout the world. The important principles of complex systems have not been communicated to the USFWS and to many other stewards of Nature. 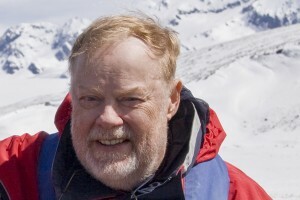 Consequently, the important and useful principles of complex systems science have not been communicated and applied to the field of ecology. There are eight characteristics of complex systems (ecosystems) that I have summarized with the hope that stewards of Nature and naturalists in all fields will begin to give these ideas some thought. Everything in Nature is connected and interrelated. Nature is a series of interconnected, hierarchal complex systems. We call them ecosystems. Energy flows within Nature’s systems through a series of special networks. Nature’s systems are both chaotic and ordered. Much of Nature’s systems are self organizing where there are no leaders. The activities of Nature’s systems are emergent where the whole is greater than the sum of their parts. Much of Nature’s forms and processes are self similar – appearing similar at different levels of magnification. Small changes within Nature’s systems can produce huge and widespread unpredictable effects. Nature’s systems cannot be reproduced by man. Nature’s systems lack predictability by mankind. 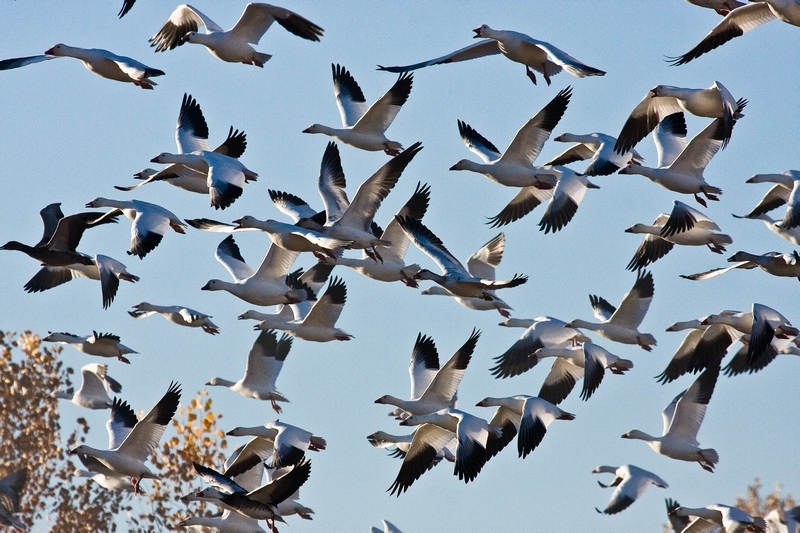 I note that the eighth trait and the second corollary states that the manager at Bosque del Apache has no way of predicting the effect, good or bad, of killing Elk or Snow Geese. 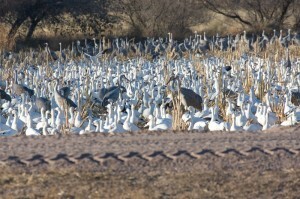 The Elk story at Bosque del Apache is a repeat of many stories like this on a worldwide basis. The important and useful principles of complex systems science have not been communicated and applied to the field of ecology. Given the limited knowledge that Nature’s stewards possess and given the limited college and university complexity science training provided in natural science curricula, it is no wonder that there is a lack of understanding about how life is interconnected within ecosystems. Their solution is to kill (they call it “manage”) wildlife without being able to define the outcome. The more difficult, but perhaps lasting, solution is for humanity to understand and work with Nature rather than trying to “manage” Nature.. I am in the process of writing a book that describes, in the language of the naturalist, the characteristics of ecosystems using principles set forth by the field of complexity science. These characteristics can be used by the naturalist as guiding principles when pondering an ecological issue and making important ecological decisions. The core of the book describes in detail each of the eight traits of Nature’s systems and their corollaries that I’ve listed in this post. I hope to publish the book by the end of 2013. As I write this book, I’m hoping to build a dialog with people from both the fields of complex system science and ecology. The purpose for this dialog is to gather responses to my ideas and to improve upon how I describe things. Given the current trends by many “natural resource managers” (a misnomer because one cannot “manage” Nature), I expect the topic to be controversial. But, at the same time, I see great opportunity to educate those naturalists who are working hard to preserve Nature. With a strong working group, it is possible to formulate an ongoing series of person-to-person dialogs with government and non-government groups as well as interested individuals. 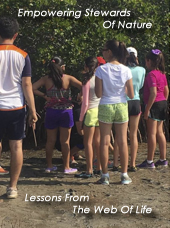 It is also possible to incorporate some of these ideas into ecology courses at high schools and universities. Your view on all of this would be greatly appreciated. a marvelous sight, and to work to find ways to help them survive this modern age. As a child I often went with my parents to some places in Michigan in the fall to see preserves for the bird on their migration. Back then I thought it was cool and it always meant a picnic along the way so it was all good. Must say I miss the experience. Living in Northern Az I’ve been able to see a lot of elk. there are too many of them and the hunting season, so they say is necessary to keep an edge on the balance. Fooling with Mother Nature is a very tricky endeavor. solid, wise decision. At this moment I personally want the preserve to stay. I care about the neighbors fields having some problems (so I’m not nice maybe) but they never cared about the lives they were changing when they settled there. You did give us more wonderful photos and some good things to think about…..Thank You! Thanks for your comments, Ellen. While there are a number of issues I addressed in this blog, I meant the main theme to be that our appointed stewards of Nature are poorly equipped with the tools necessary to make decisions such as killing elk. I found nothing in my research that would indicate an analysis of the environmental impact upon the elk population or other populatiions. There is no evidence of any thinking about how the connections within and between species would be affected with the proposed killing. What I did find in this incident (as well as similar incidents noted in other blog posts) was a heavy bias in favor of some human special interest group. Groups like farmers, cattle ranchers, and the logging industry. Far too often, I’ve seen public notices and ecological analyses that heavily favor these kind of groups instead of addressing the impact on creatures and their ecosystems. This incident is no exception. The worry is the farmer’s crops and not the elk or the birds. Beyond that, I view life in all forms as sacred. Killing an elk because he is a “nuisance animal” is very offensive to me. I am quick to add that we humans are the most overpopulated, widespread, and invasive species on this planet. What are our appointed stewards of Nature doing about this dilemma? A dilemma far more serious than an elk wanting to munch on some corn.